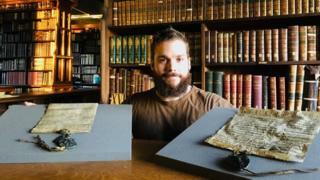 Dr Benjamin Pohl, a senior lecturer in Medieval History at Bristol University, came across the charter by chance while examining medieval manuscripts at Ushaw College. He said the document was carefully prepared and written in what was known as a "court hand", probably by a member of the king's government department or chancery. Dr Pohl said: "Discovering the original charter is extremely exciting, not least because it allows us to develop a fuller picture of the people who were present at York on 26 March 1200 and eager to do business with the new king. "Medieval charters are important not just because of the legal acts they contain, but also for what they can tell us about the society and political culture at the time. "Our charter might best be described, therefore, as a kind of 'who's who' of Northern England at the turn of the 13th Century." The document confirmed the granting of possessions in County Durham, namely the two hamlets of Cornsay and Hedley Hill, to Walter of Caen and Robert FitzRoger, Lord of Warkworth and Sherriff of Norfolk and Suffolk. Walter and Robert were nephews of Simon, a chamberlain of Durham who had originally received the grants from his bishop, Hugh de Puiset, sometime before 1183, but who later decided to part with the bequests in order to provide for his two younger relatives. Prof David Cowling, pro-vice-chancellor for arts and humanities at Durham University, said: "For one of our visiting fellows to identify an item from the collection as a previously uncatalogued medieval royal charter is a wonderful example of the benefits and advances that can be made by working and exploring our archives together." The bishop's charter, recording the original grants to Simon, is also held at Durham, allowing the two original documents to be compared and studied side-by-side for the first time.